In British Columbia where forest fires have raged so furiously over the last few fays, apparently, a total of $100M has been made available for the rebuilding of the communities and the residents. Many homes were destroyed in these fires. This is in Kamloops B.C. The areas that are reported to be the hardest ones to have these fires pass through are southern interior and central. There is also fires in the north but they're not as bad as the ones in the south. Crews are said to have battled around 230 wildfires across the province. This is with the continuing hot weather that has helped cause these intense fires. The Premier Christy Clark made the amazing announcement today. 600$ is available right now from the Red Cross for people that have registered under being forced out of their homes by these fires. Even the incoming government's transition team of John Horgan was briefed on the funds for the people. A provincial wide state of emergency was declared on Friday and this is certainly something to have been inevitable if the fires continued, which they have. Reporters were told by Clark "We are just, in many ways, at the beginning of the worst part of the fire season and we watch the weather, we watch the wind, and we pray for rain,"
"But our prayers aren't always answered in these things and so we need to be there to support people in the meantime because there are hundreds and hundreds of people who are scared to death right now." She continued. Three of the largest fires forced thousands to be evacuated and had a size of around 14-20 square kilometers. 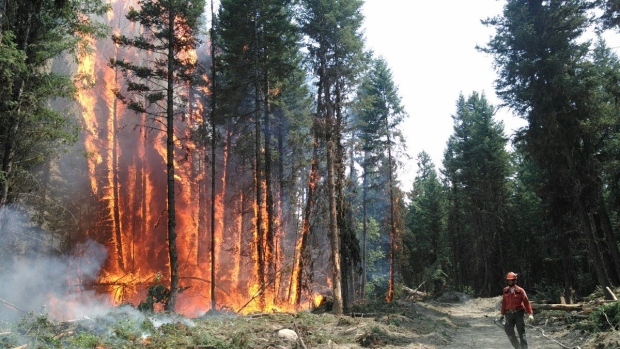 In the region of Cariboo Regional District as many as 6,000 people were evacuated. It is reported that more evacuation orders were sent out on Sunday. 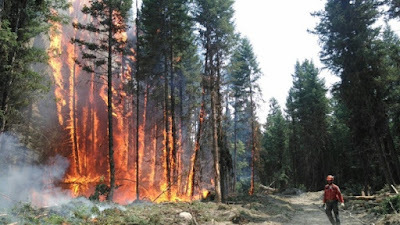 There are about 1,000 firefighters in the province battling these dangerous fires. There is even 200 contractors and additional personnel of 600. The number of firefighters needed is so high that 300 more from other provinces are being recruited for the tasks to help. These people are being supported by helicopters and even heavy equipment. Christy Clark said: "As well, communities and residents have also stepped up and rallied together to help all those who need it,"
The Mayor of Cache Creek, John Ranta said: fires have burned dozens of buildings between Cache Creek and Ashcroft. The fires are said to even have burned down two airport hangers and 30 trailer park homes and around 5 houses. The Mayor said: "We have tremendous sympathy for the challenges we are all collectively facing,"
The manager of the Kamloops fire center Rob Schweizer said: "We probably haven't seen this sort of activity that involves so many residences and people in the history of the province of B.C.,"
"I can only imagine what the last 24 hours have been like for the people here in this room. Our hearts go out to you. It's a very stressful and trying time." This is a reminder to some residents fo the incident that occurred last year in Fort McMurray where thousands were evacuated as fires raged and destroyed people's homes, items, and caused tons of damage. That was in Alberta.